NIWRA (click) has been successfully rehabilitating wildlife on Vancouver Island for a quarter of a century. Robin and Sylvia Campbell have dedicated their lives to alleviating suffering of wild creatures and releasing them back to the wild. 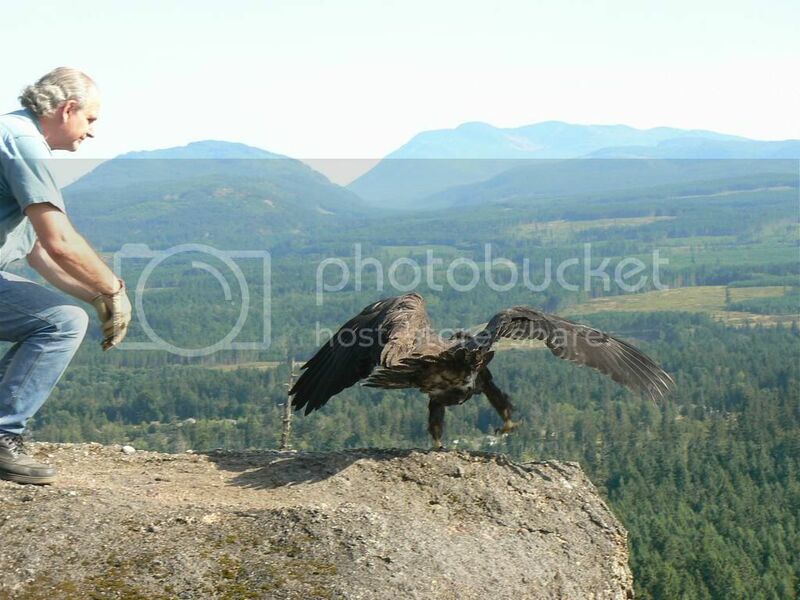 This is a photograph of Robin releasing a young eagle from Little Mountain. The mountain is conveniently located just above the Centre in Errington. Robin handles the bird with consideration for the young eagle's exciting flight to freedom and return to the wild after being in his care. In 1984, Robin Campbell, NIWRA's founder, discovered a Great Horned Owl entangled in a neighbor's fence, its wing mangled and in need of emergency care. It was Christmas day and the Christmas dinner would have to wait. Spirit, as the Owl was later named became our first of many casualties at the Buckley Bay Wildlife Recovery Centre (by the Denman Island Ferry). Later in 1986, the newly formed association moved to an eight acre parcel of land in Errington, BC, and changed its name to North Island Wildlife Recovery Association, hoping to serve the north end of Vancouver Island, B.C., not knowing at the time we would be receiving animals from as far away as Saskatchewan. Over the years, NIWRA, has developed its expertise having dealt with oil spills, wildlife rehabilitation, short term rehabilitation of bear, wolf and cougar, and has developed extensive educational programs for the public. We are proud to have the largest eagle flight cage (measuring 140' x 30' x 20') of its kind in Canada, which has housed hundreds of eagles being readied for release. NIWRA is instrumental in building and managing the V.I. Black Bear Rehabilitation Program where bears are successfully rehabilitated and released back into the wild. Visit the website and find many interesting facts and see the photos of NIWRC's residents and some educational material. Wildlife officials are concerned about the potential impact introduced species will have on native species which have not developed defense mechanisms against an introduced animal. Education is very important to the Campbells. There is a Learning Centre at NIWRC and Sylvia writes a regular newspaper column to keep the public informed about what is happening to wildlife. I posted an earlier link in our forum to a January 21 story in the local newspaper about North Island Wildlife Recovery Centre, our local wildlife rehab place, which "is preparing this year to celebrate 25 years of assisting injured and abandoned wildlife". Link to Newspaper story - CLICK This facility boasts the largest indoor flight cage in North America and started out close to the Denman ferry terminal in Buckley Bay (jumping off point for Hornby Island) before moving to its present location. This article gives an interesting account of how the centre developed, and their particular interest in bald eagles and bears. NIWRC is also instrumental in partnership with Dr Malcolm McAdie a leading marmot expert in the world. He uses their well equipped hospital to aid in the recovery of Vancouver Island Marmot, the most critically endangered mammal in the world. Is there a picture of Robin gently putting the eagle down so he could get his bearings before he flew off? This picture shows Robin releasing the young eagle. Beautiful nice view, he may even be in your neighborhood Madrona. 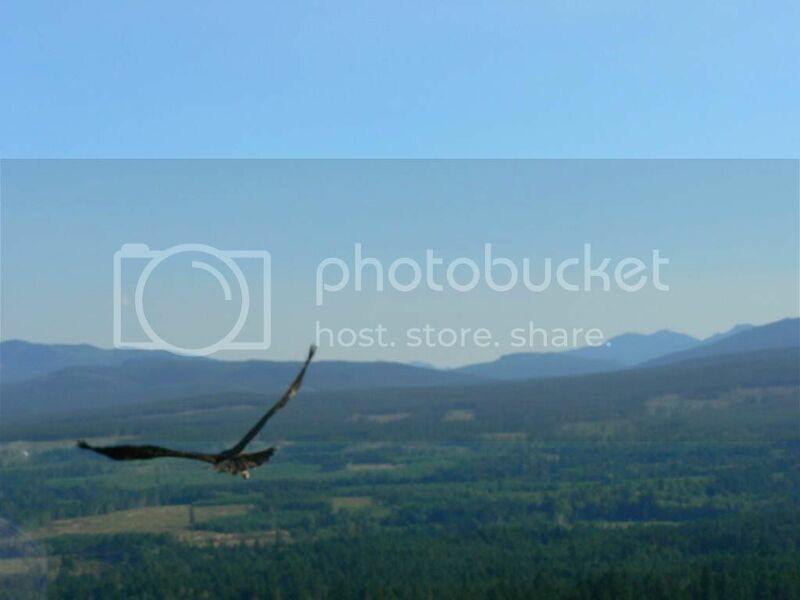 I was fortunate to meet Robin and witness an eagle release (the one pictured above). The care and devotion is so apparent - and the respect and gentleness which he handles the birds is outstanding. It is so good to read about all the different species these wonderful people rescue and rehab. Such a quiet and soft spoken man with a big heart of gold! I'm so glad this thread was added and I am looking forward to reading more posts! There are so many natural hazards that wildlife has to survive, it is unfortunate that man's pollution of the environment contributes to the mortality rate. PORT ALBERNI, B.C. — Two Vancouver Island eagles that died last spring were killed by ingesting lead — possibly from eating fishing jigs or discarded lead shot, toxicology reports show. The North Island Wildlife Recovery Centre recently received toxicology reports on two eagles submitted for testing in March 2009. The two eagles from the Parksville and Qualicum Beach were severely emaciated and had no fractures or visible hemorrhaging. Just one or two ingested lead pellets can kill a bird, and it usually takes only 10 days from ingestion until a bird displays visible symptoms of lead poisoning being displayed. How long the lead takes to kill the bird depends on a number of factors, but it's usually a matter of three weeks to six weeks. Canada banned lead shots in the mid-1990s. Pellets lodge in the bird's gizzard, where acid and grinding action dissolves the lead. It's then absorbed into the bird's bloodstream, causing lead poisoning. I thought immediately of that picture, Nancy, when I read the NIWRC article about the lead poisoned eagles. This link (from the August 2009 issue of Taking Flight - a REGI newsletter) gives some detail about what is involved in treating lead poisoned eagles. After nearly a full year of public testimony, discussion, and environmental analyses, the Fish and Game Commission modified the Methods Authorized for Taking Big Game (Section 353, Title 14, CCR) in December, 2007 to prohibit the use of projectiles containing lead for hunting deer, bear, wild pig, elk, and pronghorn antelope in areas designated as California condor range. Modifications to Methods of Take for Nongame Birds and Mammals (Section 475, Title 14, CCR) were also adopted to prohibit the use of lead projectiles in the same areas when hunting coyotes, ground squirrels, and other non-game wildlife. These regulations became effective July 1, 2008. The condors were eating the carcasses of the game shot and left behind by hunters. The lead in the bullets poisoned the condors. Canada has prohibited lead shot for years but there is still a lot of lead lying around. The birds (waterfowl) sometimes ingest the lead while foraging in the marshes. Knut the resident bear at NIWRC has come out of hibernation. A tour of the NIWRC by Jay & Christine (ParksvilleQualicum) they have a white raven at the facility.